We are involved in producing industrial high purity gases having variety of applications. Oxygen, hydrogen, nitrogen, argon, nitrous oxide, helium etc. These gases are stored in proper and safe way. The gases are pure and without any adulteration. We have well reputed name in providing high purity gases which are offered at market leading rates. 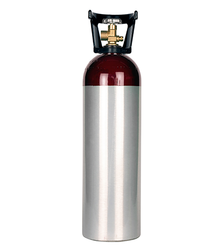 We are offering Helium Gases to our clients. The second lightest element, helium is one of our most precious natural resources. It will not combine chemically at any temperature with any other element. It is non-flammable, non-toxic, and non-explosive. Its chemical inertness makes it perfect for a variety of applications. Helium's most common application is as a shielding gas for arc welding. Because of its high voltage gradient, it transfers more heat to the weld than does argon at the same arc lengths. This added heat is essential for high-speed welding. Itself a product of billions of years of radioactive decay beneath the earth's surface, helium is not affected by radiation. Radioactive immunity, along with excellent heat transfer makes it an ideal heat transfer agent for gas-cooled nuclear reactor.